As part of their 2010 market expansion iTrip.net, a full-service, web-based vacation rental management system, has announced the addition of Costa Rica to their vacation rental properties. The properties, which include oceanfront homes and condos, can be rented for as low as $195 per night. “At iTrip.net we strive to provide the most beautiful vacation rentals in the industry. Adding Costa Rica to our vacation rental property lineup will allow those who are looking for an exotic vacation near the Pacific Ocean to enjoy all the amenities of home while being able to experience the beautiful country,” stated Steve Presley, Founding Member of iTrip.net. With a strong close to 2009 iTrip.net has plans to expand to multiple new markets in 2010. iTrip.net currently features vacation rental properties in Destin, Panama City, Orlando, South Walton Beach and Perdido Key in Florida, Hilton Head Island in South Carolina, and Gulf Shores / Orange Beach in Alabama. 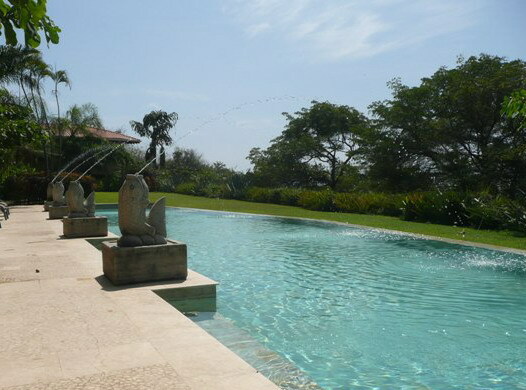 These properties, including those in Costa Rica, are available for daily or weekly rental. The new autopista a Caldera will be inaugurated on January 27th, one week before the national elections, Costa Rican president, Oscar Arias, announced in Puntarenas on Saturday. “For the first time I made it here (Puntarenas) in 50 minutes by way of the new highway”, Arias told a crowd during a tour of the Pacific port town. 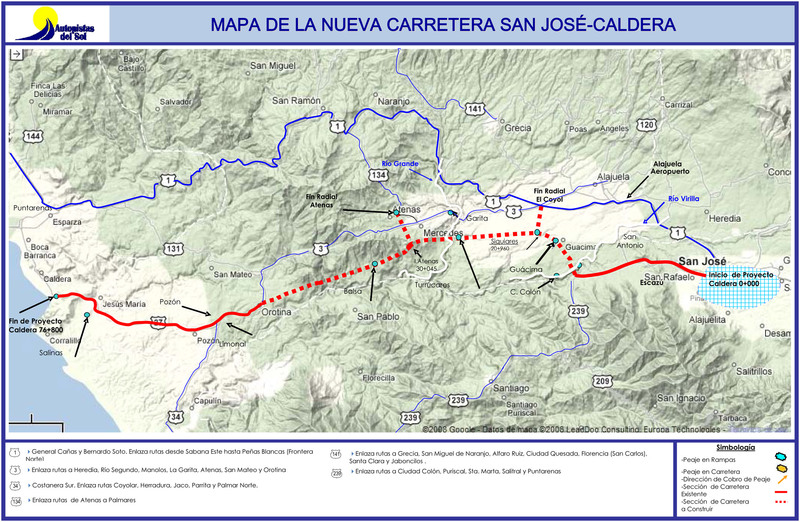 The section between Santa Ana and Orotina of the new San José – Caldera highway that is not yet open to the public, had been scheduled to be open in March, pushed up from the original June opening date when construction commenced two years ago. However, advances in the work enable it open early. President Arias called the new highway a “gift to Puntarenses”, saying that Costa Rica has waited almost 40 years for this highway to become a reality, for the port city to have easy and fast access to San José and vice-versa. The new road allows travel between La Sabana on the west side of San José to Caldera, south of Puntarenas, in less than 45 minutes. Currently it takes between 90 and 120 minutes to make the same trip. The savings in time is because the highway cuts through the mountains, eliminating the steep climbs and drops on the current routes, as well the slowdown in traffic caused by big trucks and buses. The sections between San José and Santa Ana and Orotina and Caldera have been open since last year, remaining was the middle portion. The cost of tolls to travel the 77 kilometres of the new highway, from end to end, is about ¢1.500 colones each way for passenger vehicles and motorcycles, more for heavy trucks and buses. Every day more and more Europeans make Costa Rican their vacation destination. According to the Cámara Nacional de Turismo (Canatur) more people from the “Viejo Continente” (Old Continent, as Europe is referred to in Costa Rica) are curious to discover the country they hear so much about. 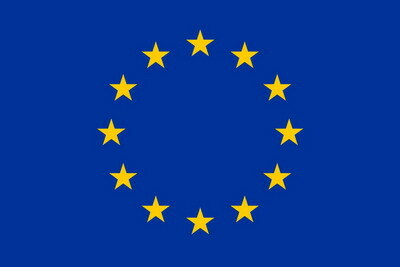 Canatur says that in 2009, Costa Rica received 187.486 European tourists, the majority from Spain. And for that Costa Rican tourism officials are attending the Feria Internacional de Turismo (Fitur) that is ongoing in Madrid, Spain, this week. The objective for 2010 is increase on the 2009 numbers and at least 32 Costa Rican tourism operators are attending the Fitur. For Costa Rica, Europe is an emergenging market for tourists and an increase in European tourism will decrease Costa Rica’s dependence on American tourists that now make up the bulk of the almost 2 million annual visitors to Costa Rica. For more than a decade Costa Ricans and foreigners living and visiting Costa Rica have had to accept the decisions of the Instituto Costarricense de Electricidad (ICE) with respect to cellular telephone service, with poor service, no coverage in many areas and the banalities of a state institution of dictates who can and who cannot subscribe to their cellular service. For decades ICE had the monopoly on telecommunications. But that all changed at the end of 2008 with the passing of the Ley General de Telecommunicaciones, which allows the opening of the telecom sector and breaks the decades old ICE monopoly. But what has really changed? Let’s take a look. Improving on the TDMA technology that was first in use in Costa Rica, ICE moved to GSM. But, as with the TDMA, service was spotty, especially in rural areas and there was always a lack of sufficient lines to meet the demand, causing long lines ups at ICE offices when lines were made available. 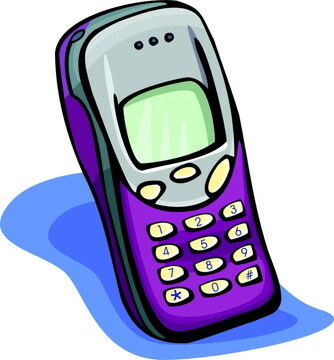 The ICE policy also created black market for foreigners and visitors who wanted to get connected, since only citizens and “legal” residents could subscribe to cellular service, a policy that was instituted quickly after the introduction of the first cellular service in the late 90’s. Today, that policy continues, even tough the technology has changed, like the ability to offer pre-paid cellular service and the fact that ICE now has more than sufficient lines to meet the demand. According to Jaime Palermo, director of División de Clientes, ICE will soon make available for pre-paid cellular service with the GSM lines customers are trading in for the 3G. Palermo says that 110.000 GSM customers have already switched over, the majority of clients who had “high end” phones and wanted to take advantage of services like the transmission of data (internet over the cellular network). However, that news does not really change anything for foreigners or visitors, as ICE continues to maintain the “residency” policy in effect, a policy that even extends to subscribing only to the cellular internet service, a service that uses a USB stick to connect a computer to the 3G network. Although ICE now has hundreds of thousands of lines of the 3G network available and will soon free up 300.000 lines of the GSM network, foreigners living in Costa Rica and those just visiting cannot obtain any type of cellular service. That policy even extends to those foreigners who obtained their cellular service before ICE instituted the residency policy, where they can transfer their TDMA service to the 3G, but cannot obtain any new additional services. And it gets worse for those subscribers, as ICE will not be returning the difference of the deposit, not yet anyways. With the subscription to TDMA service, ICE required a deposit of ¢60.000 colones (us$260 dollars when the exchange rate was ¢225 colones to a dollar). Now it only requires a ¢12.500 deposit (us$22). Transferring TDMA customers could get a refund or credit on the difference or the entire deposit back if they cancelled their service entirely. But, that is not happening just yet, as ICE says it does not have the ability to issue those refunds or credits just yet. “Maybe in February”, said Palermo. For those who already took out their calculator will notice that the refund is some us$210 short. Now, multiply that by hundreds of thousands of customers who are subscribed to the TDMA. How is that? Well, when ICE was asking for ¢60.000 colones, the exchange rate was around ¢225 colones per one US dollar. Now, the exchange rate is hovering at ¢570 colones per one us dollar, which means ¢47.500 colones is only us$83 and not us$210 when the deposit was paid. 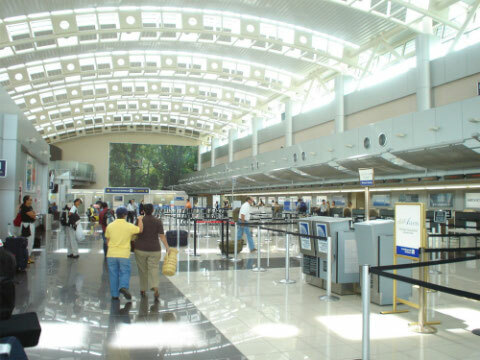 At the request of the United States the Dirección General de Aviación Civil (DGAC) has tightened its security protocols at the Juan Santamaría (San José) and Daniel Oduber (Libera) international airports on flights to the US. The measure follows the attempted terrorist attack on Christmas day on a flight from Amsterdam to Detroit, Michigan. Among the changes are that passengers will not be able to carry on their carry on any powdered substance. Items like coffee, sugar, salt, cacao or powdered milk are a no on, unless they are purchased within the terminal’s retail stores. Jorge Fernández, director of Aviación Civil, is emphatic that passengers travelling to the US should buy items like coffee only from stores in the airport terminal – these are the stores beyond the security checks, near the boarding gates. The only exception to the rule, according to Fernández are prescribed medical items and infant formula and milk. However, these items will be closely inspected by the Policía Aeroportuaria (airport police) before boarding. The restrictions on liquids, like gels, creams, toothpaste, etc, continues if they are in packaging over 100ml. Also xray machines and metal detectors will continue to inspect carry on luggage. Fernández said that in addition to all of this, passengers on US bound flights will have to submit to a final boarding inspection, this being done by the airlines, independent of the security checks and controsl of the DGAC. Although the tightened security measures are geared towards US bound flihts, Copa airlines, part Continental airlines, said it would be adhering to the US security measures though Copa has no direct flights to the US from Costa Rica. The director of the Policía de Vigilancia Aérea stationed at the Santamaría and Oduber airports, Glen Pacheco, said that passengers can expect more exhaustive checks to impede passengers from boarding with any dangerous substance or material.